The Black Friday 2018 deals are starting early on November 16. Update 11/19/2018 - The full list of titles discounted on the PlayStation Store has now been released. Sony has released the first few deals we can expect from the official PlayStation store during Black Friday 2018. Announced in a blog post on the PlayStation site, the deals showcased include offers for Spider-Man PS4 bundles, PSVR and controllers. 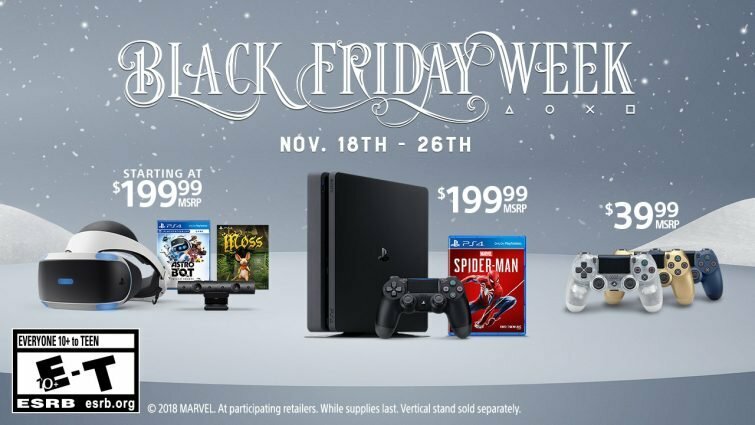 Overall they shape up very similarly to deals revealed by Walmart, Best Buy and others, but according to the blog post, early discounts will begin for several games on November 16 in the US, running up until Black Friday itself on November 23. PSVR bundles starting from $199. While it’s nice to know that offers are coming, right now the deals Sony has announced are fairly vague, so we’ll update this page when the specifics on the PSVR and PS Plus discounts are revealed. For now, check out our Black Friday 2018 gaming hub for all the best deals we've seen so far.